But efforts by experts to generate reliable malnutrition data in the country might go in vain due to raging debates over the way malnutrition is assessed. 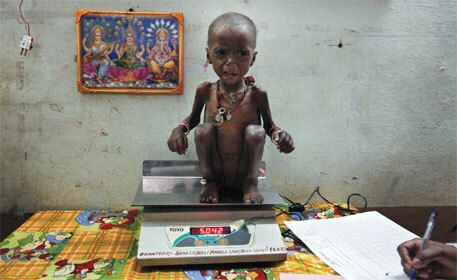 Panagariya is not the only one to have criticised WHO’s malnutrition measurement formula in the recent months. In July, economist Reuben Abraham, who is the executive director of the Centre for Emerging Markets Solutions at the Indian School of Business in Hyderabad, and a non-resident scholar at New York University, argued in a news daily that malnutrition is a multidimensional phenomenon. It should be categorised into protein deficiency and micronutrient deficiency, and diagnosed only through medical assessment. Several health experts have also expressed doubt over the WHO formula. “How can one formula fit the entire world?” asks Umesh Kapil, professor of human nutrition at the All India Institute of Medical Sciences (AIIMS), Delhi. But India was among the six countries that were part of the WHO survey while preparing the formula (see ‘Just for reference’). This means the formula should work well for India. Many health experts and activists say the debate is uncalled for. “The WHO formula tells us the ideal size of a child. So there is no harm using it in the Indian scenario,” says H P S Sachdev, senior paediatrics and clinical epidemiology consultant at Sitaram Bhartia Institute of Science and Research, Delhi. “There might be genetic differences but we assume that given the right facilities, all populations grow in a similar way,” he adds. A blog published in web-journal riceinstitute.org/wordpress on April 8, 2013, shows mother’s social status can also result in malnutrition among children. Reetika Khera of IIT-Delhi and Diane Coffey and Dean Spears of Princeton University in the USÃ”Ã‡Ãªconducted a survey in rural India. They concluded that children of younger sons in a family are shorter than those of elder sons, even though they live in the same household and are exposed to the same environment. This is because wives of younger sons usually experience lower social status within the household, for instance they have less decision-making power, meaning they have no control over food. “We must understand that non-food factors, such as water, sanitation, healthcare and the height of father, play significant roles in the development of children,” says Sachdev. “Creating a new formula or reference for all subgroups without understanding these factors will further confuse us,” he says. Activists allege that people who are advocating changes in the WHO formula have vested interests. Sachin Jain of Bhopal non-profit Vikas Samvad, says Panagariya wants to prove that the open economic model India adopted 20 years ago is perfect. Advocates of this model have managed to fabricate statistics of poverty and other development indicators to prove that the model is effective. Now they are trying to change the malnutrition formula, Jain adds. Commenting on Panagariya’s article, Dipa Sinha, an activist with the Right to Food Campaign, says there are attempts to medicalise the malnutrition problem. These people demand to shift focus from malnutrition to micronutrient deficiency. They advocate medical checkup of each and every children to assess whether they are malnourished or not. They want to deal with the deficiencies using medicines. These measures will only benefit the private healthcare sector. “We strongly believe that the chronic malnutrition of our children could be removed by providing them healthy food, including milk and eggs,” Sinha suggests. Vandana Prasad of the National Council for Protection of Child Rights, concurs. Malnutrition is a complex issue. The focus should be on intervention measures to eradicate malnutrition from society rather than discussing the right formula to assess it, she says. “Even if one changes the formula and manages to reduce the number of malnourished children by a few percentage, say 5-10 per cent, what purpose will it fulfil?” asks Arun Gupta, regional coordinator of Breastfeeding Promotion Network of India. “We would still require interventions to check the prevailing malnutrition in the country,” he says. Instead of arguing about the right formula, economists should throw light on why problems such as lack of drinking water, sanitation and healthy food persist after so many years of adopting open economic policy, Gupta says. Leave alone various methods followed to identify malnutrition children in INDIA. In one of the recent issue of Lancent they reported malnutrition can be linked to open defecation that is prevalent in INDIA.GOI started Nirmal Bharath abhiyan for improving sanitation. We need to increase health and sanitation facilities in rural areas. This can be achieved by introducing Universal Health Care Systems under public domain.